This is one of the biggest reasons people say, "I don't want to do math, it's too much work." We all find ourselves cowering behind the mighty 5 saying, "2.4? Okay, that's close enough, let's round it to 2.5." 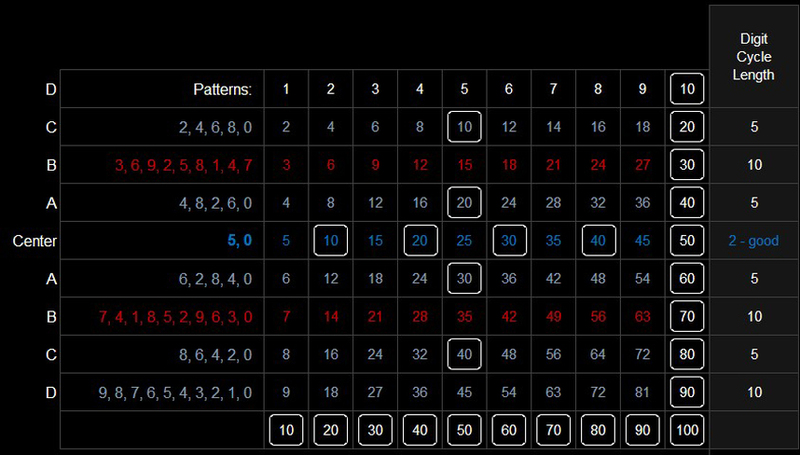 Contrast this to the dozenal multiplication chart, we find many patterns and less rules to remember. Notice the big open areas without zero enders in the 4 corners of the grid. All of those numbers, you'll have to memorize in your times tables. With all these zero enders, the sequences are straight forward. You can feel confident in your multiplication that takes just seconds to double check. Those 5's and 7's are a pain sure, but when you can take a number like 64, 49, or 36 and multiply that with ease, you'll wonder why we still use the decimal system. * read ​7's even trick is below. In our decimal system, it's very often that you'll look at a number like 51 and think, "gee, that looks prime, but it might not be." But as it turns out, 51 is not prime; It's divisible by 3 and 17. Another problem is that we find it hard to tell what a number can be divided by. As we see above, if it ends in, 2, 3, 4, 6, 8, 9, ᕍ, or 0, we know for a fact that is is not prime. In this next section, I talk about the tricks with each digit on the multiplication table. As you read ahead here, I get the feeling that if this was taught to children, they would learn their tables much faster than in decimal. In decimal, there are a few tricks here and there, but it's mostly up to memorization. Blue is right hand. These are our ones. 1) The one's column is the same as in our multiplier. 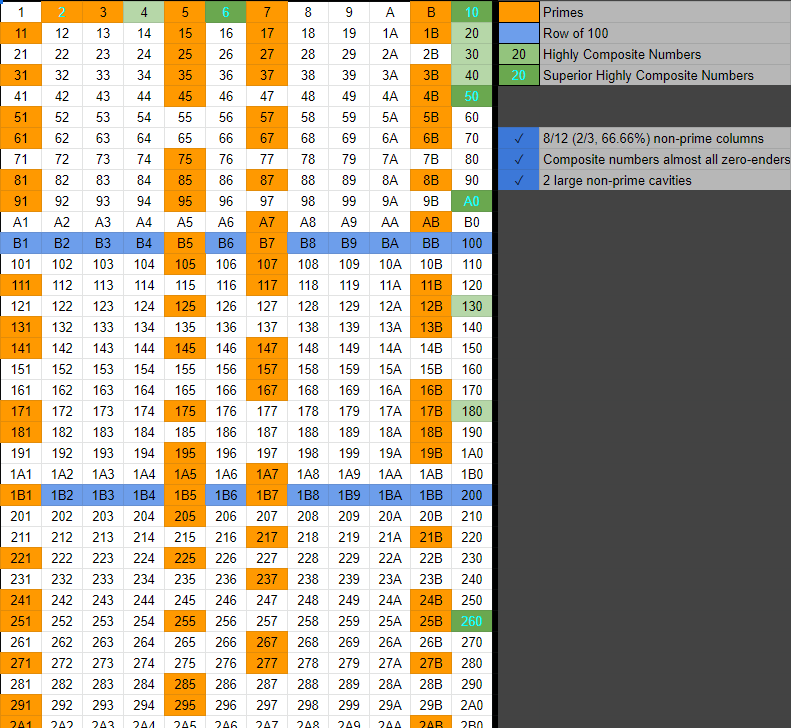 2) Half the multiplier is equal to the 10's column. Odd multipliers have no special tricks. But we can do a multiplier one less and then add 7. Count your fingers using this pattern: "4, 8, 0". Every time you say, "zero", close your fist. Every time you reach zero, count a finger on your left hand (that's your dozens). You have 3 sets on your left hand. Your right hand landed on a 0. Count your fingers using this pattern: "8, 4, 0". Every time you say, "zero", close your fist. Start with 1 in your left hand (our multiplier is more than 8). Every time you reach "four" or "zero", add one to your left hand. Your right hand landed on a 4. Count your fingers using this pattern: "3, 6, 9, 0". Every time you say, "zero", close your fist. 3, 6, 9, 0; 3, 6, 9. You have 1 set on your left hand. Your right hand landed on a 9. Count your fingers using this pattern: "9, 6, 3, 0". Every time you say, "zero", close your fist. Start with 1 in your left hand (our multiplier is 9, not 3). Every time you reach "six," "three," and "zero", count a finger on your left hand. 9, 6, 3, 0; 9. Ƹ is identical to 9's in the decimal system. Dozens: Subtract 1 from your multiplier. Ones: Count how far that digit is away from Ƹ. 5 is has some similarities between 7. But it's still very unique and difficult.. Ones: How many more does your multiplier need to reach the next 0 ender? Dozens: Take your multiplier, subtract 2, then divide by 2. To read more, continue onto Symmetry at the top (within the introduction tab).